Link to discussion of synapses and their neurotransmitters. often have "reuptake" transporters that reclaim the transmitter back into the cell when it has done its job. Postsynaptic neurons display receptors to which the neurotransmitter binds. All of this machinery provides many targets for alteration by exogenous chemicals; that is, psychoactive chemicals introduced into the body. These drugs fall into several distinct families. All of these drugs mimic the stimulation provided by the sympathetic nervous system. Link to discussion of the sympathetic nervous system. Nicotine binds to a subset of acetylcholine (ACh) receptors. ACh is a neurotransmitter at synapses early in the pathways of sympathetic stimulation. Although a weak drug in one sense, nicotine is strongly addictive. The use of e-cigarettes, chewing gum and skin patches containing nicotine is designed to satisfy the craving for nicotine while avoiding the serious health effects of other ingredients in cigarette smoke. Amphetamines and cocaine bind to — thus blocking — transporters used for the reuptake of dopamine (and noradrenaline) into presynaptic neurons. This causes the level of dopamine to rise in the synapses. High levels of dopamine in an area of the brain called the nucleus accumbens appear to mediate the pleasurable effects associated with these (as well as other) psychoactive drugs. to help children with attention deficit/hyperactivity disorder (ADHD) to perform better in school. At first glance, this second use seems counterproductive. This controversial procedure seems to work by increasing the alertness of the child so that it can focus its energies more effectively on the tasks in front of it. that were prescribed for losing weight. Because of reports of occasional very serious side effects, the mixture is no longer available and fenfluramine has been removed from the U.S. market. Cocaine has been used for thousands of years by certain tribes in the Andes of South America. Cocaine and some of its relatives have legitimate medical uses as local anesthetics (e.g., lidocaine). However, the widespread recreational use of cocaine has created serious social problems. Immunity to cocaine addiction? In order to achieve its effects, cocaine must cross the so-called blood-brain barrier. If antibodies are bound to the cocaine molecule, it cannot cross. This has raised the possibility of immunizing people against cocaine. It works in mice. Ethyl alcohol (ethanol) is, by a wide margin, the most widely used drug in most of the world. Its popularity comes not from its sedative effect but from the sense of well-being that it induces at low doses. Perhaps low doses sedate those parts of the brain involved with, for example, tension and anxiety and in this way produce a sense of euphoria. However, higher doses depress brain centers involved in such important functions as pain sensation, coordination, and balance. At sufficiently high doses, the reticular formation can be depressed enough to cause loss of consciousness. Ethanol increases the release of the neurotransmitter GABA activating GABAA receptors (inhibitory — LINK) and directly inhibits NMDA receptors. Barbiturates are often prescribed as sleeping pills and also to prevent seizures. Barbiturates mimic some of the action of ethanol, particularly in their ability to depress the reticular formation (thus promoting sleep) and, in high doses, the medulla oblongata (thus stopping breathing). Barbiturates bind to a subset of GABA receptors designated GABAA receptors. These are ligand-gated channels that enhance the flow of chloride ions (Cl−) into the postsynaptic neuron, thus increasing its resting potential and making it less likely to fire. By binding to the GABAA receptor, barbiturates (and perhaps ethanol) increase the natural inhibitory effect of GABA synapses. Barbiturates and alcohol act additively — the combination producing a depression greater than either one alone. The combination is a frequent cause of suicide, both accidental and planned. physical dependence — withdrawal of the drug precipitates unpleasant physical and psychological symptoms. These traits are also shared with nicotine, opioids, and other psychoactive drugs. These chemical relatives of cocaine act by blocking the voltage-gated Na+ channels of sensory neurons preventing them from generating action potentials. [Discussion] They are injected or applied topically and block transmission not only in pain-conducting neurons but in others as well (causing general numbness). Most of these are volatile hydrocarbons or ethers. Diethyl ether and chloroform are seldom used today, having been replaced by safer alternatives such as isofluorane, a fluorinated ether. Some, like isofluorane, bind to inhibitory GABA receptors) in the brain hyperpolarizing, and thus decreasing the sensitivity of, postsynaptic neurons. Others, like ketamine, block the activity of excitatory glutamate receptors. 1,4-Butanediol is a common solvent. When ingested, it is converted into γ-hydroxybutyrate, an increasingly-popular (and illegal) "club drug". γ-Hydroxybutyrate acts on GABAB receptors. Conversion of 1,4-butanediol to γ-hydroxybutyrate requires the enzyme alcohol dehydrogenase, the same enzyme used to metabolize ethanol. Ingesting both ethanol and 1,4-butanediol delays the effects of the latter. These are substances isolated from the opium poppy (and often referred to as opiates) or synthetic relatives. Opioids depress nerve transmission in sensory pathways of the spinal cord and brain that signal pain. This explains why opioids are such effective pain killers. Opioids also inhibit brain centers controlling coughing, breathing, and intestinal motility. Both morphine and codeine are used as pain killers, and codeine is also used in cough medicine. Opioids are exceedingly addictive, quickly producing tolerance and dependence. Although heroin is even more effective as a painkiller than morphine and codeine, it is so highly addictive that its use is illegal. Methadone is a synthetic opioid that is used to break addiction to heroin (and replace it with addiction to methadone). By binding to mu (µ) receptors, opioids like morphine enhance the pain-killing effects of enkephalin neurons. Opioid tolerance can be explained, at least in part, as a homeostatic response that reduces the sensitivity of the system to compensate for continued exposure to high levels of morphine or heroin. When the drug is stopped, the system is no longer as sensitive to the soothing effects of the enkephalin neurons and the pain of withdrawal is produced. Mu (µ) receptors are also found on the cells in the medulla oblongata that regulate breathing. This accounts for the suppressive effect opioids have on breathing. bind to µ receptors but instead of activating them, they prevent the binding of the opioids themselves. In fact, if the receptors are already occupied by, for example, heroin molecules, naloxone will push the heroin molecules off and quickly rescue the patient from a drug overdose. Naltrexone is used to help recovering heroin addicts stay drug-free. Tranquilizers act like sedatives in reducing anxiety and tensions. Most belong to a group called benzodiazepines and include such commonly-prescribed drugs as Xanax® and Ativan®. This is the same receptor to which barbiturates (and perhaps ethanol) bind. Thus although benzodiazepines seem safe enough when used alone, combining them with ethanol or barbiturates can be (and often has been) lethal. Antidepressants fall into four chemical categories (of which we shall examine three). Most share a common property: they increase the amount of serotonin at synapses that use it as a neurotransmitter. These drugs act on a mitochondrial enzyme that breaks down monoamines such as noradrenaline and serotonin. By inhibiting the enzyme in presynaptic serotonin-releasing neurons, more noradrenaline and serotonin is deposited in the synapse. Some examples: Parnate®, Nardil®, Marplan®. For several reasons, MAO inhibitors are not used much anymore. These drugs block the reuptake of noradrenaline, dopamine, and serotonin causing an increase in the level of these neurotransmitters in the synapse. Although tricyclics are still prescribed for pain relief, their role as antidepressants has largely been taken over by the serotonin reuptake inhibitors (SRIs). These drugs inhibit the reuptake of serotonin but not of noradrenaline. Although all these drugs quickly increase the amount of serotonin in the brain, there is more to the story than that. Unlike most psychoactive drugs, antidepressants do not relieve the symptoms of depression until a week or more after dosing begins. During this period, the number of serotonin receptors on the postsynaptic membranes decreases. How this translates into relief of symptoms is not yet understood. Because they act on the reuptake of both serotonin and noradrenaline (norepinephrine), this category of antidepressants is also known as dual reuptake inhibitors. Examples: venlafaxine (Effexor®) and duloxetine (Cymbalta®). Bupropion (Wellbutrin®) is a novel drug that blocks the reuptake of noradrenaline and dopamine. Although it does not interfere with the uptake of serotonin, it also appears to be an effective antidepressant. This drug (Strattera®) selectively interferes with the reuptake of noradrenaline. It is used in children with attention deficit/hyperactivity disorder (ADHD). Psychedelic drugs distort sensory perceptions, especially sight and sound. 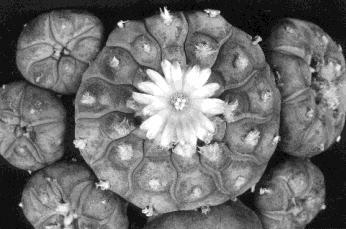 The photograph (courtesy of Dr. Richard Evans Schultes) shows the peyote cactus in flower. The cactus head contains several psychedelic chemicals, of which mescaline is the most important. Dried cactus heads ("mescal buttons") have been used since pre-Columbian times in the religious ceremonies of native peoples in Mexico. About a century ago, this religious use spread to some tribes in the United States and Canada who, in 1922, became incorporated into the Native American Church. As their name suggests, DOM and MDMA also share the stimulant qualities of amphetamines. All the psychedelics have a molecular structure that resembles serotonin and probably bind to serotonin receptors on the postsynaptic membrane. PCP is used as an anesthetic in veterinary medicine. Used (illicitly) by humans (called "crystal" or "angel dust"), it can produce a wide variety of powerful reactions resembling those of stimulants as well as psychedelics. Unlike the other psychedelics, it binds to (and inhibits) NMDA receptors (in the hippocampus and other parts of the forebrain). CB2 receptors are also found in the brain as well as being highly-expressed on cells of the immune system (e.g., B cells and T cells). in high doses, the perception-distorting effects of the psychedelics. Unlike sedatives and opioids, however, tolerance to THC does not occur. In fact, the drug is excreted so slowly from the body that, with repeated use, a given response is achieved by a lower dose. Both of these compounds are produced from phospholipids. those whose genes for the CB1 receptor have been "knocked out" eat less than normal. These findings will be no surprise to the ill humans (e.g., with cancer or AIDS) who find that marijuana improves their appetite. development of correct synaptic connections in the embryonic brain. Mice whose genes for the CB1 receptor have been knocked out develop defects in the wiring pattern of interneurons in their brain (which may account for the cognitive defects that have been reported in the children of women who used marijuana during pregnancy). neuronal activity in the adult brain. Mice whose genes for the CB1 receptor have been knocked out are more susceptible to epileptic seizures. Marijuana has been used for centuries to control epileptic seizures in humans. suppressing contact dermatitis. Knockout mice lacking CB1 and CB2 receptors mount a more vigorous allergic inflammatory response to agents (like nickel) that elicit contact sensitivity.